In July, 1962, it was decided to create a technical sub-committee to be doubly assured of being supplied with proper and adequate relay implements. This sub-committee was called upon to examine all such articles and to consider all factors of technical and practical aspects. The torches used in the previous Olympic Games at Rome and the past Asian Games were studied in detail. In the initial testing this was done on the assumption that the actual combustion period of each torch would last 14 minutes for the ones to be used within Japan and six minutes for those for use abroad. Other conditions sought were: The torch should be one which could be ignited easily, would be strong in wind and rain resistance, yet one which could be easily disposed of after use. A cylindrical container with a stainless steel coating, filled with priming powder and fumigant, was perfected after a number of trial productions and experiments. Bowl is inscribed: " XVII Olympiad Tokyo 1964" and Olympic Rings. 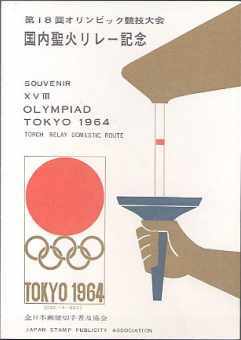 The bottom of the cylinder features the Tokyo official logo. The holder was designed to match with the torch. In selecting its material, its weight and other factors were carefully considered, and resulted in the selection of an alloy with aluminium as its chief ingredient. For the safekeeping of the Olympic Torch at the various stopping places and while being relayed by the plane, an Olympic Torch burner was selected, designed on the principle of the coal-mine safety lamp. The fuel used for this burner was kerosene, and emphasis was laid on the safety factors. Fuel of a high flash point was selected and the appearance of the flame and other technical factors were carefully taken into consideration in perfecting this burner. The burner-carrier was so designed that even while the Olympic Torch was being relayed by the runners, the Torch's counterpart could be kept burning safely in the accompanying automobile, hung by a special air-cushioning device. On the relaying plane, also ample protection factors were incorporated for the Olympic Torch to eliminate any hazards of fire and accident. This was standardized for use both in the foreign countries and in Japan. The mark of the Tokyo Olympic Games was embroidered onto the breast of the all-white running shirt (for men) and T-shirt (for women). Pants and shoes were supplied to all official runners. On 21st August 1964, H.M., King Constantine II of Greece, together with H.R.H., Princess Irene, as chairman of the Hellenic Olympic Committee, arrived at Olympia. They laid a lourel wreath at the tomb where the heart of Baron Pierre de Coubertin is enshrined. 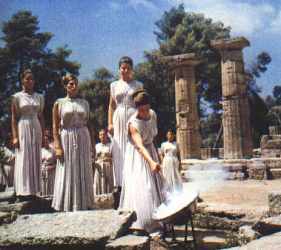 About this same hour, at the ruins of the ancient Temple of Zeus, the Priestesses were igniting the Sacred Olympic Flame in the Bowl from the heat of the rays of the sun. This Olympic Torch in the Bessel, guarded by junior priestesses, was then transferred to the site of the Ancient Olympics, where H.M. the King, H.H. the Princess, President Brundage of the International Olympic Committee, President Yasukawa of the Organizing Committee, Chairman Takashima of the Olympic Torch Relay Dommittee and other officials were waiting. 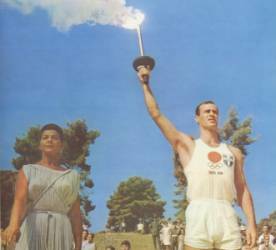 In this impressive ceremony, Chief Priestess, Mrs. Aleca Katselli lit the Torch from the vessel, and handed it to H.M. King Constantine, who in turn handed the Torch to the first relay runner, George Marcellos, the Greek 110-yard hurdle champion. With the torch held high, Marcellos first stopped at the Coubertin Memorial Park, to light the Olympic Flame Cauldron in front of the shrine. He then proceeded to Pyrgos, the first relay point. 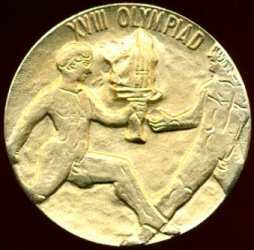 Thus was started the Olympic Torch on the relay which was to take it all the way to Tokyo in the Far East, to link the two continents of Europe and Asia. The Torch was carried northward along the shores of the Ionian Sea. The sun began to set as the Torch reached Patras, at the mouth of the Gulf of Corinth, but the relay runners pressed onward to Athens through the night under the pale light of the full moon. It was on the following evening that the Torch finally reached the marbleconstructed Pan-Athenian Stadium, the first venue of the Modern Olympics. Here the city of Athens turned out to welcome the Sacred Fire. After the second fire had been set aflame on the mounted cauldron especially set up at the stadium, and amidst the impressive ceremonies of benediction, the relay started again, this time to the Hellinikon Airport. It was here that the Sacred Torch was taken into Japanese custody for the first time, as the Torch was handed over to the President of the Organizing Committee for the XVIII Games, Mr. Yasukawa as representing Japan's Olympic delegation. The Olympic Torch, kept at rest in the Airport precincts overnight, was carried to the special Olympic Torch Relay Plane, "City of Tokyo" on the following day, 23rd August. At 2.15 p.m., the plane took-off for Istanbul, the first stop-over city, and landed at the Yesilkoy Airport in the suburb of Istanbul at 5.00 p.m. that evening. The Olympic Flame thus spent its first night in Asia in Turkey. On the 24th the flame was flown to Beirut (Lebanon) and Teheran (Iran); on the 27th to Lahore (Pakistan); the 28th to New Delhi (India) and Rangoon (Burma); the 31st it was in Bangkok (Thailand); 2nd September in Kuala Lumpur (Malaysia) and the 3rd of September in Manila (the Philippines). 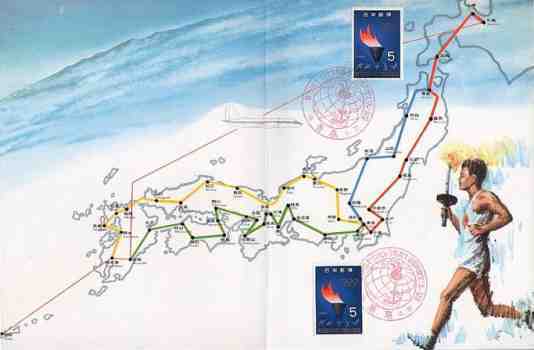 At each of these air relay stopover cities, the Olympic Torch received a most enthusiastic reception. Up to this time, the extra day each scheduled in reserve had been spent in Beirut and Bangkok. At New Delhi, the Torch was apportioned in order to present a flame of the Sacred Fire to the representatives of Nepal who by previous arrangement had been given permission to use it in a relay ceremony at Katmandu. This apportioned Torch was then air-relayed back to Calcutta to rejoin the main Torch. Thus was fulfilled the wish of Nepal, a new Asian members of the International Olympic Committee. The special relay plane reached the Kaitak Airport of Hong Kong on 4th September, despite intermittent heavy rain due to an approaching typhoon. The Olympic Torch was handed under the cover of an umbrella to Mr. A. de O. 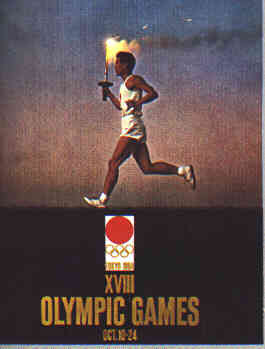 Sales, chairman of the Hong Kong Olympic Committee, and from him to the relay runner. The Torch, relayed through the streets of Kowloon was then ferried from the Kowloon wharf to the island of Hong Kong on the Governor-General's private launch, and the Sacred Flame burned throughout the night at the City Hall. At midnight on the fourth, Hong Kong was struck by a Typhoon, and the special plane moored at the airport suffered a damaged wing, which rendered it impossible to be used for flying This incident necessitated the first alteration in the detailed Torch Relay schedule. Japan Air Lines to meet this emergency, rushed a Convair 88DM jet plane from Haneda to Hong Kong, and this enabled the relay flying from the Kaitak Airport only one day behind the schedule. Unfortunately however this substitute plane itself developed engine trouble just after the take-off and the flight was again delayed. To prevent further delay, another plane was made available by switching over a plane of the same type which was in Hong Kong on a regular scheduled flight. This emergency measure made possible the take-off on the same day, and enabled the plane to reach Taipei at 5.00 p.m. that same evening and just one day behind schedule. Tens of thousands were at the Taipei International Airport to welcome the Sacred Torch carrier.